Rewire the pathways in your brain to experience deep and lasting contentment. Happiness is far more than a positive feeling that comes and goes. Science is now proving that happiness is a skill that you can develop. List some enduring benefits of happiness. Describe the negativity bias of the brain. Summarize how our brains can make us happy and also create suffering. Practice guided exercises for tapping your innate capacity to nurture and encourage yourself. Utilize meditation to shape your brain over time to experience more joy and be more at ease in everyday life. Apply techniques that re-wire the neural pathways in the brain to experience deeper and more lasting happiness. 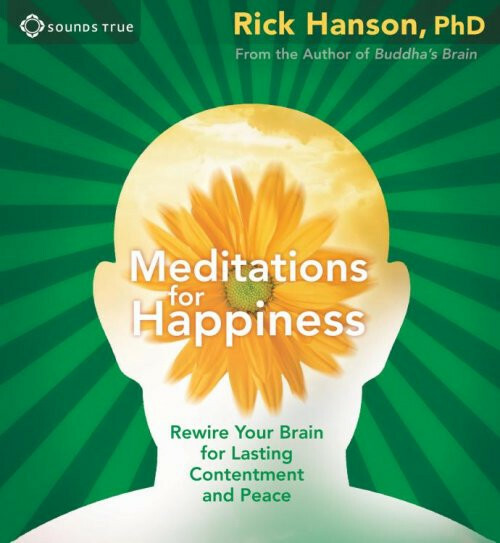 Bridging neuropsychology with the great contemplative traditions, Meditations for Happiness brings you a series of practices that allow you to literally rewire the neural pathways in your brain to experience deeper and more lasting contentment. "Emotions come and go, but true happiness endures," teaches Dr. Hanson. With Meditations for Happiness, he helps you build a foundation of skills for realizing the happiness you desire. Led to my daily happiness practice of noticing and appreciating moments of happiness throughout each day. I am recovering from years of major depression, and had a daily meditation practice for 2.5 years when I bought this recording. At the time, I had been feeling fairly well for a couple of months but was slowly sliding downwards as the darkness of winter approached. I was initially turned off by Rick's all happy introduction that another reviewer suggested was like "Mr. Rogers", but I kept an open mind and am happy that I did. As a result of this recording, I have developed a daily happiness practice which, as I noted in my opening line, keeps me aware of, and appreciative of the many moments of happiness that arise in me each day. As this practice developed I came to realize that happiness is not a lasting state, and that increased happiness is something that I could "learn". Through developing mindfulness I have come to recognize that my feelings are always changing, and while negative feelings like anger and sadness tend to last longer, the positive feelings like joy and happiness are transient and often brief (at least for me). With my daily happiness practice (doing what Rick recommends in this recording), I can now look back when I am feeling depressed and realize that I have had moments of happiness every day (or at least almost days) for many weeks/months, and just this realization often beings about another moment of happiness. Not joy, but a deeply-rooted and gentle happiness that I believe has kept me from spiraling back into a major depression this winter. I think that the strong and immediate impact of this recording on my life was because I had a daily meditation practice and through that I am fairly mindful of what I am feeling both physically and mentally. For anyone thinking they are not mindful, this recording may inspire you to work at developing that mental skill. I do not recommend that anyone who is severely depressed listen to this recording and can really relate to Anna's 1-star comment. When I was severely depressed I could not see anything to be happy about, and I think that I too would have found this to be a depressing reminder of all the things that I thought that I did not have. Review for Meditations for Happiness Review by Gloria K.
I enjoyed the lecture and meditations. I hope they see a smile on my next cranium catscan! This is brilliant--intellectually, emotionally, spiritually.